Odell Beckham Jr. had an up-and-down night with a couple dropped passes but also some big receptions. He also drew some crucial defensive pass interference penalties. 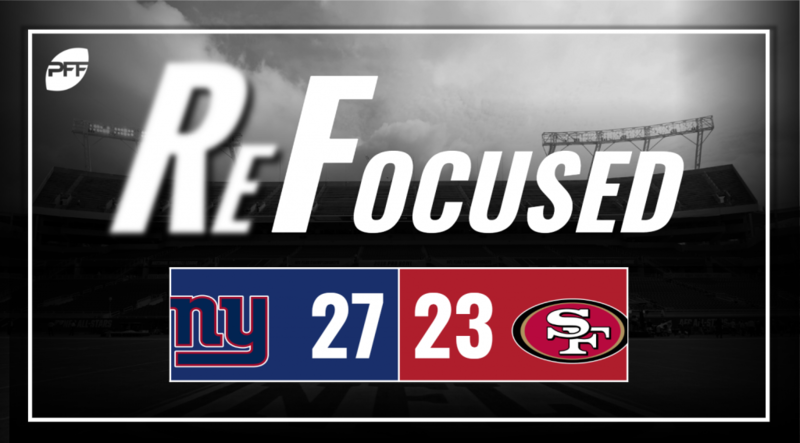 The Giants’ passing game did enough late to get the job done. Eli Manning made some quality throws and avoided the big mistake in the Giants’ comeback win. Saquon Barkley flashed his high-end potential running the ball, as he made several nice cuts and made the best of his offensive line’s blocks on the ground. He also made a nice play after the catch on the Giants’ go-ahead drive. The Giants struggled to get much of a pass rush going throughout the night. With a few exceptions, much of the pressure generated by New York’s front came late in the down with Mullens hanging onto the ball and looking to make a play downfield. New York struggled to defend 49ers’ George Kittle in the middle of the field. San Francisco’s breakout star at tight end consistently got the better of Landon Collins and Alec Ogletree on his way to 83 yards on nine receptions. DeForest Buckner was a man possessed rushing the passer, as he was harassing Manning all game long. It looked like the pressure San Fransico was applying would be the difference in the game, but in the later stages of the fourth quarter, the 49ers ran out of gas. Ahkello Witherspoon was in the middle of the action all night, as he had the task of covering Beckham. He made some plays early, and then as the game progressed, Beckham made plays on him. It was fun to watch. Nick Mullens was up-and-down in his second career start. He often held on to the ball too long and struggled with accuracy at times, most notably when he threw late and behind Kendrick Bourne on a pass that was ultimately intercepted off a deflection to set the Giants up with a short field. But Mullens was also solid when throwing to the middle of the field in the short and intermediate area. Matt Breida was effective on the ground, picking up over 100 yards on his 18 carries. Despite not forcing many missed tackles, Breida was often able to find yards that didn’t look to be there on an uncharacteristically shaky effort from San Francisco’s offensive line in the run game. Barkley, Manning and OBJ made some nice plays in the second half to spark the Giants’ comeback. Inconsistency from Mullens and costly defensive penalties on the Giants’ game-winning drive kept San Francisco from finishing on top.